Did you recently inherit a diamond? Are you interested to know whether or not the diamond is real? Are you thinking of purchasing a diamond for that special someone, but worried the great deal you spotted means that you will be wasting money on a fake? These are two common situations where you could benefit from diamond appraisal skills. Calling in a professional is one way to do it, of course, but maybe you cannot afford it, or maybe you do not have a referral, so you don’t know who you can trust. Either way, here are a variety of steps you can take and techniques you can try to determine whether the diamond is fake or real. This applies while you are shopping, and is equally vital online and offline. 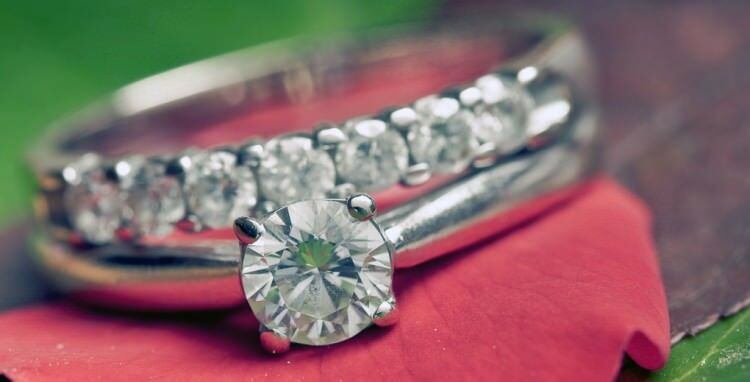 In both situations, you should be able to ask the jeweler for a certificate from a third-party appraiser which states that the diamond is real. Do not accept certificates from in-house. If a jeweler refuses to provide one of these, shop somewhere else; you cannot trust the seller. What kind of metal do you see? If a diamond is set in gold or platinum or high-quality silver, that is a good sign. Be wary of diamonds set in cheap metals like copper. You generally will not see this with a real diamond. Essentially, the stone itself is so valuable that setting it in a cheap metal cheapens the entire piece, and no one is going to do that. If you are able, use a carat or gram scale to weigh the diamond in question against a confirmed diamond that you are certain about. Both stones need to be roughly the same size and shape. Cubic zirconia weighs around 55% less than diamond. So if you find you have two gems and the one you are suspicious of weighs significantly less than the other and you are certain the other is real, you are looking at a fake. This sounds complicated, but all it means is that you need to check if you are able to see through the diamond. The index of refraction refers to how the stone bends light. A diamond has a high index of refraction, so it bends light sharply. This is why they sparkle so much. You should not be able to see through a diamond. If you can, it is probably an imitation made out of a substance like glass or quartz. Whether or not a diamond is colorless, it should not have a range of colorful hues present in the reflections. The reflections should be grey or white or close to it, depending on the tint of the diamond itself. They should not be rainbow-colored. If you see rainbow-colored reflections, the gem you are looking at is either something else altogether, or not a pure diamond. If you can, put the diamond under a microscope and examine it again. Turning it upside-down is best for this test. Do you notice a flash of orange tracing the facets? This is a common tell-tale for cubic zirconia. If you see it, it means the stone either is cubic zirconia, or cubic zirconia has been used to fill fractures. While you have that microscope out, look for imperfections in the diamond (you can also use a loupe to do this). If you see any, that is a good sign! Real diamonds almost always have some kind of imperfections. Cubic zirconia on the other side is generally imperfection-free. Note however that real lab-grown diamonds (as opposed to real natural diamonds) may also be imperfection-free, so you may still have a diamond if there are no imperfections. It may simply be one that was created in a lab and not by natural processes. If you happen to have a heat probe, you can test the diamond in about thirty seconds. Diamonds tend to deflect heat. The heat probe should not be successful in getting the diamond’s temperature to rise very far. If the stone heats up quickly, it is probably a fake. If you do not have a heat probe, you can run a similar test just by breathing on the diamond. Since a real diamond will deflect the heat, it should also deflect the moisture. As a result, you will have a hard time fogging it up, and even if you succeed, it will clear quickly. A gem which is easy to fog up or which remains fogged up for more than a couple seconds is likely a fake. Many diamonds display some degree of fluorescence under a black light. Not all of them do, and the colors that they display can vary, so this is far from a foolproof test. It may help you get on the right track, though. If you see your diamond glowing blue under a black light, it may very well be real, because blue is the most common diamond fluorescence color. No glow or a different hue does not necessarily mean your diamond is a fake. It does make it less likely it is real, however. 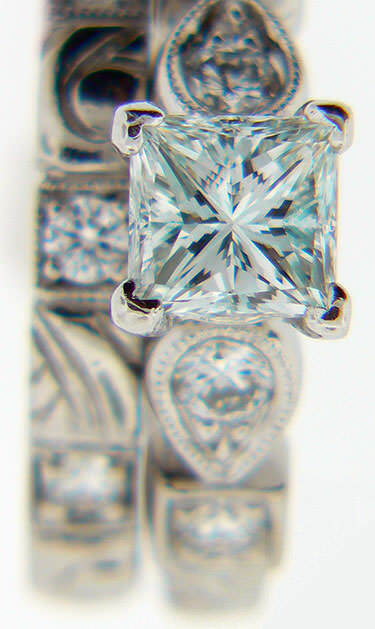 Moissanite, a common diamond substitute, often glows green, yellow, or grey. Rarely you will see this tint with a real diamond, so if you do, it probably is a fake. You will want to take additional steps to confirm or deny the stone’s identity though. A diamond tester, also known as a moissanite tester, is a handheld electronic device you can carry with you into a store. You can test a diamond quickly and easily this way with pretty good accuracy. While this probably isn’t a purchase that would be worth it to you to test a single diamond, it would be a very smart buy if you regularly purchase diamonds. Finally, a test that does not work is using an X-ray. This test is often recommended online, but seems to have no foundation whatsoever. Supposedly you can take an X-ray of a gem and if it shows up on the X-ray, you can assume it is something other than a real diamond. There is no indication however that this is anything but a myth. Diamonds are not invisible on X-rays. How do we know this? Because in South Africa, diamond miners are routinely X-rayed to check if they are smuggling diamonds out of the mines in their digestive tracts. If diamonds didn’t show up on X-rays, they wouldn’t use them, would they? You really do not need an X-ray to test a diamond anyway, not with so many other methods available which work and are far less expensive! You may need to combine several of these methods before you can be positive of what you are looking at. If the results are all favorable, you should feel confident that you have a real diamond. If the diamond fails multiple tests, it is almost certainly a fake.